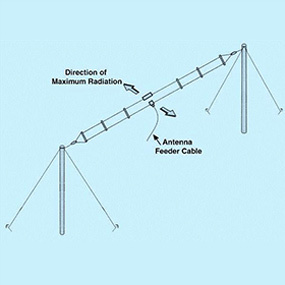 The HF Broadband Two Element Folded Dipole Antenna provides optimum performance over complete HF band, eliminating the requirement of multiple antennae or an Antenna Tuning Unit (ATU). The antenna is designed by using two folded arms with a matching Balun. It can be mounted for Horizontal polarization in a standard dipole configuration using two masts of 50 feet each. Total space required for installing the HF Broadband Dipole Antenna in the Horizontal polarization is 30 x 10 Meters.